Want to read this in convenient pdf format? Then click here. The Farmscape Ecology Program is continuing to evolve in exciting ways. On our fifteen year anniversary, we have been reflecting on the pages of reports and boxes of insect specimens that our research has filled, and thinking about how to share this accumulation in new ways. As part of this process, we are contemplating a significant change – reimagining our Program’s space as a field station. This “Farmscape Ecology Field Station” would serve not only as a continued base for our research and educational programs, but also as a space that attracts visitors through intriguing, stimulating exhibits and workshops. Can we convert the Creekhouse, our existing program building, into a new space that leads people of all ages and backgrounds into a “museum” or experience and then draws them out into nature? Much of the content and ideas for the Field Station will be drawn from our past work. Below you will find a summary of our Program’s work in 2018 and beginning thoughts on how this work might inform our Field Station as we look ahead. During the past year, we expanded our experimental agroecology work with the Creation and Monitoring of Beneficial On-Farm Habitats in collaboration with the Xerces Society and USDA/NRCS. 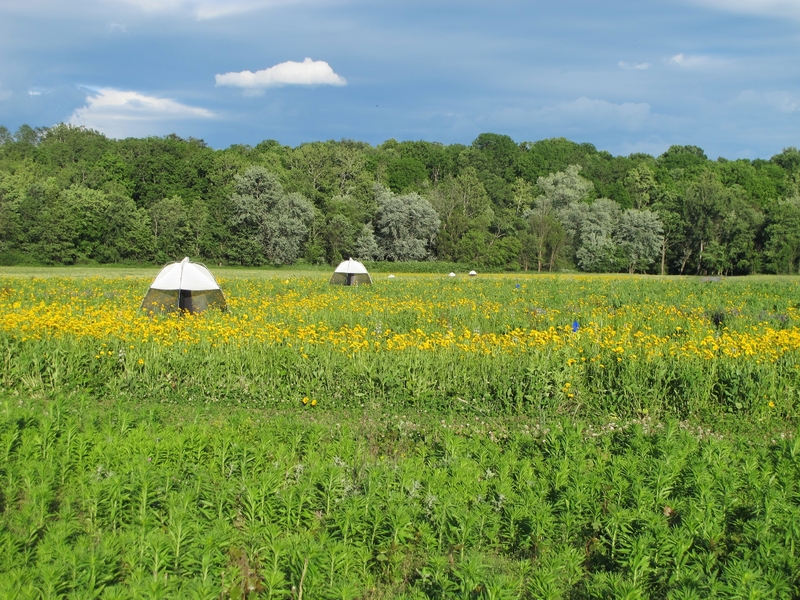 This initiative had begun in 2017 with the establishment of 4.5 acres of Native Meadow Trials at the Hudson Valley Farm Hub and a small perennial wildflower planting in a vegetable field here at Hawthorne Valley Farm. In 2018, we continued to monitor the development of the soils, vegetation, and insect communities in the Native Meadow Trials at the Farm Hub and presented the results from the first two years of this trial to the public at a well-attended field day in September. A report will soon be available online. Here at Hawthorne Valley Farm, we tripled the area of the perennial wildflower patches, created two beetle banks, and improved hedgerows. Such well-documented examples of beneficial on-farm habitats are not only intended to improve the synergies between farm production and nature conservation, but also serve as demonstration, inspiration, and learning opportunities that we plan to feature in the future Farmscape Ecology Field Station. 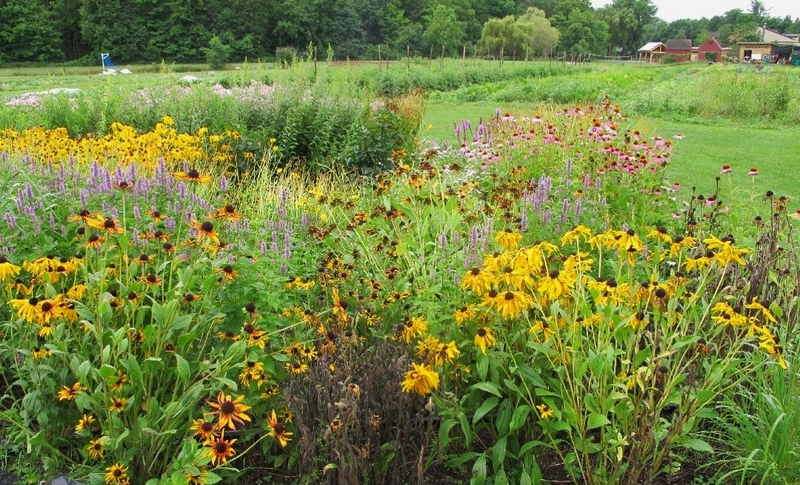 A perennial wildflower planting in a vegetable field at Hawthorne Valley Farm. Such beneficial on-farm habitats provide nectar and pollen, as well as shelter for beneficial insects, such as pollinators and parasitic wasps. As part of our work with the Hudson Valley Farm Hub, we coordinated--together with our Farm Hub colleague Anne Bloomfield--the ongoing ecology research on this 1,200+ acre farm which recently transitioned to organic management. The Applied Farmscape Ecology Research at the Hudson Valley Farm Hub involves investigators not only from the Farmscape Ecology Program and the Farm Hub, but also Hudsonia Ltd., SUNY New Paltz, and SUNY Albany. This ongoing research includes monitoring of water quality, soil health and the abundance, diversity and behavior of insects, birds and turtles. Results will be presented at the Northeast Natural History Conference in Springfield, MA in early 2019 and will eventually also be available online. A group of students from SUNY New Paltz and their professor, Shafiul Chowdhury, monitor water quality adjacent to the field of the Hudson Valley Farm Hub. Early this year, we drafted a report on our 2017 Multi-farm Applied Farmscape Ecology Research. In that study, which involved four farms, we looked at how habitats around crop fields may influence the abundance of beneficials in the crops themselves. This study was described in two reports available online (The Unseen Farm: A Contribution to Mid-Hudson Valley Farmscape Ecology and Flower Diversity and Floral Area on Four Mid-Hudson Valley Farms. We shared and discussed the results of this study with the participating farmers, university researchers and students, extension agents, and the general public, and will also be presenting these at the upcoming Northeast Natural History Conference in Springfield, MA. 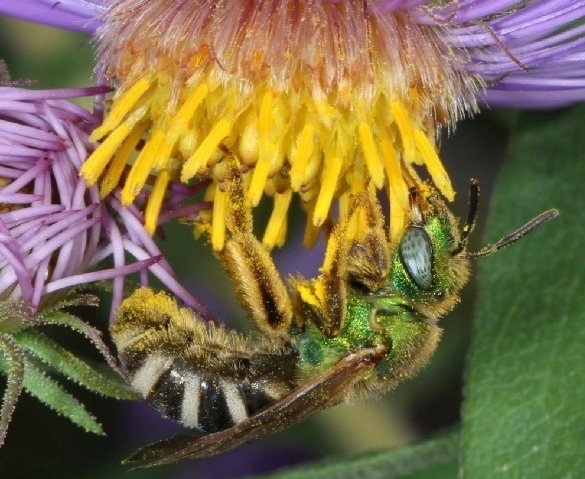 A native bee visiting New England Aster. We built on and expanded the Progress of the Seasons Project with a phenology unit taught to 9th and 10th graders at the Hawthorne Valley Waldorf School. We used the curriculum we had piloted at Darrow the previous year, and engaged students in the direct observation of the unfolding of Spring, the collection of field data, its sharing with a national citizen science network, and the comparison of the past and current timing of seasonal events. This unit is scheduled to be taught again at Hawthorne Valley Waldorf School in the coming year and continues to be taught at Darrow School. We are about to begin our 4th year of weekly documentation of the phenology of 75 individual plants here at Hawthorne Valley, which contributes data to the US National Phenology Network, and will continue to be a core activity at the future Farmscape Ecology Field Station, perhaps through a well-marked self-guided phenology trail. We also collaborated with Kerissa Battle (New York Phenology Project) who analyzed the historical data we made accessible in our historical phenology browser in her PhD thesis. We are currently working closely with Kerissa on preparing a paper derived from this research for publication, and plan to co-present results at the 2019 Northeast Natural History Conference. 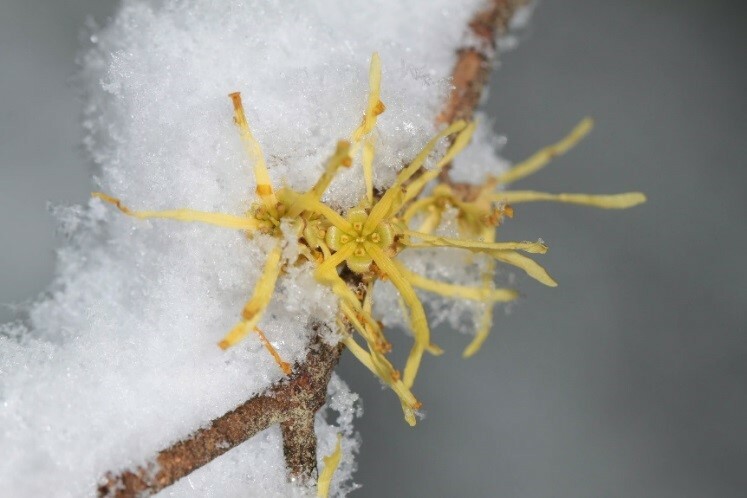 The beautiful yellow flowers of the native Witch-hazel shrub in our forests open in late fall and take an entire year to develop their seeds. We contributed to several Biodiversity/Natural Resource Inventories, ranging in geographic scope from individual private parcels or farms, to public conservation areas, towns, and finally the county level. During this year, we cooperated on these projects with Hudsonia Ltd., the Columbia Land Conservancy, the Mountain Top Arboretum, Glynwood, Scenic Hudson, the Columbia County Environmental Management Council, and the Conservation Advisory Council of the Town of New Lebanon. 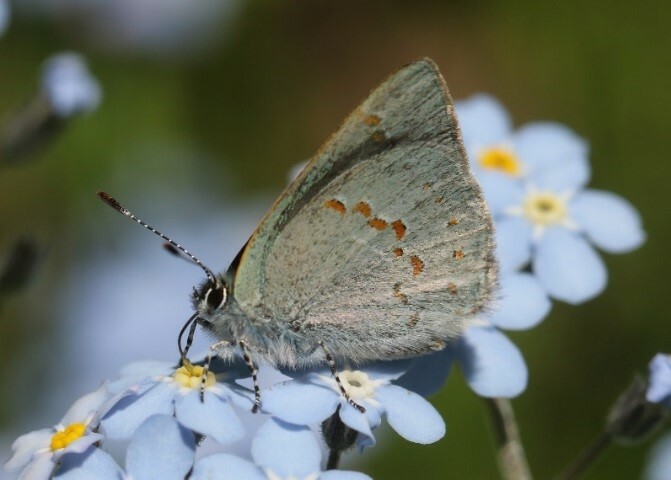 We also continued to build and update the Biodiversity of Columbia County section of our website, which provides species lists for several groups of organisms who share the County with us. Exploring local biodiversity, perhaps as ‘characters from our flora and fauna’ will serve as one basis for displays at the future Field Station. The Early Hairstreak is a rare butterfly we documented this year at the Mountain Top Arboretum in the Catskills. We are working slowly, but steadily towards the eventual publication of the Ecological and Cultural Field Guide to the Habitats of Columbia County. Although it has taken a bit longer than anticipated, the Program remains committed to completing the Field Guide; indeed, we imagine habitat research and displays forming a key part of the Field Station and our future outreach. Aside from underestimating the time required to go from data collection to publication, one reason for the delay in the Guide's completion has been the opportunity to build on other aspects of our work. The current anticipated date for publication is the end of 2019. Finally, we offered an active Outreach Program and provided training and opportunities for ecological research to interns, graduate students, and volunteers. We regularly shared our insights and experiences in presentations, workshops, guided walks, newspaper articles, blog postings, and on social media. We also served as a community resource, responding to inquiries from farmers, landowners, land trusts, conservation advisory councils, and the public at large. We plan to substantially evolve and expand our outreach in the coming years with the Farmscape Ecology Field Station. 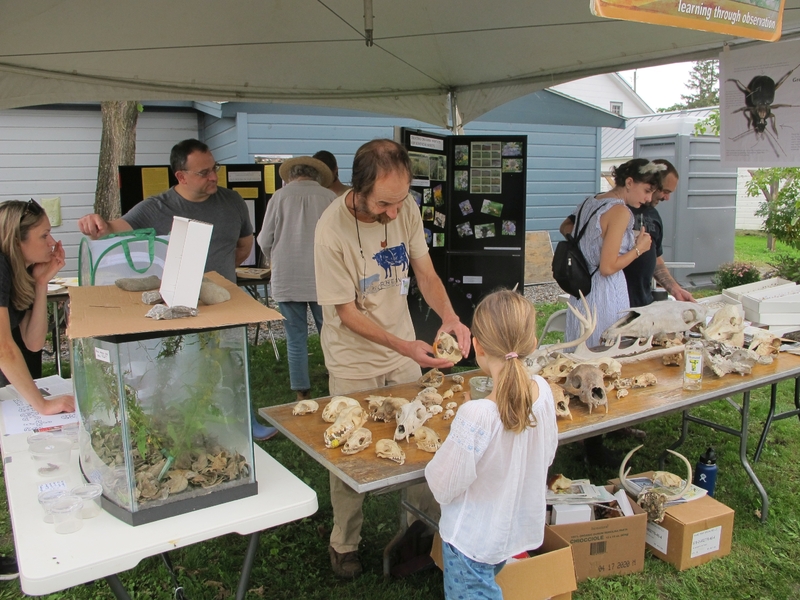 The Farmscape Ecology display at the Annual Fall Festival at Hawthorne Valley Farm attracted a steady stream of interested visitors of all ages. In June, our permanent staff grew to five with the addition of field technician Kenny Fowler. Kenny studied Conservation Biology at St. Lawrence University and brings a passion for birds and insects to his work at the Farmscape Ecology Program. During the summer, we were joined by intern Brenna Bushey, a graduate student from Bard College, who got a taste for our work by participating in all aspects of it. Erin Allen, a graduate student from SUNY Albany, worked part time with the Farmscape Ecology Program team on the monitoring of flower visitors at the Hudson Valley Farm Hub. Kristelle Esterhuizen, a former farm apprentice here at the farm, joined our team part time to create beneficial habitats at Hawthorne Valley Farm. Liam Henrie, a former intern with our program, returned part time to help with the identification of wasp samples. Dylan Cipkowski has been splitting his time between the Program and his MA studies in Environmental Studies at Antioch University. He will soon be back full steam and with a tool box of exciting new skills. As always, the new year will bring efforts to tie up the work of past years, digesting what we have learned and considering how it might shape our future work. However in 2019 this process holds new excitement, because we will now be envisioning an entirely new way of sharing such ‘digestion’ and consideration – our Field Station. More than a mere repository for field notes, specimens, and reports, the Farmscape Ecology Field Station is meant to pioneer forms of sharing that we hope will be enticing and inspiring. We seek to create a place that people might come to simply for fun and might leave from with renewed curiosity. To tell you the truth, as with any new venture, it’s a bit scary, but we hope it will also be fun and thought-provoking. We also hope that many of you will join us on this new journey by giving feedback on our Station ideas and perhaps even lending a hand when we begin the process of making it a reality. Our work this year was made possible by generous program support (some of it financial, some of it institutional and/or collegial) from the Arthur & Eileen Newman Family Foundation, Community Greenways Collaborative, Fidelity Charitable Gift Fund, Flying Deer, Gerda and Ole Skaarup Fund, Harvard Forest, Hawthorne Valley Collaborative Fund, Hudson Valley Farm Hub, Hudsonia, Hygeia Foundation, Margaret Roach’s A Way to Garden, Natural Resources Conservation Service, Northern Forest Atlas Project, RSF Social Finance Commonplace Fund, Sandy River Charitable Foundation, T. Backer Fund, Xerces Society, and 115 private donors. We are deeply grateful for this support. Our thanks also goes to our Program’s wonderful volunteers, technicians, interns, and part-time co-workers, as well as the farm staff both here at Hawthorne Valley Farm and the Hudson Valley Farm Hub who helped with the establishment and maintenance of beneficial habitats. Sampling insects in the native meadow trials at the Hudson Valley Farm Hub.